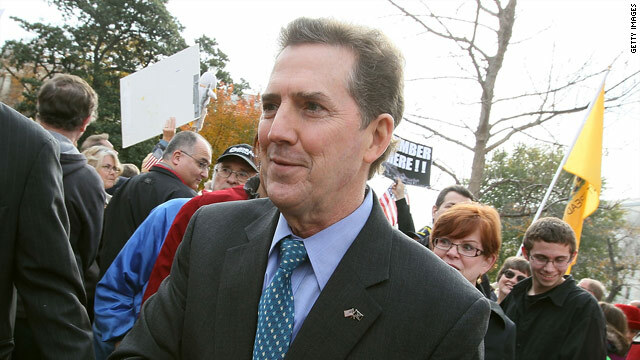 Washington (CNN) - News that South Carolina Sen. Jim DeMint will travel to Iowa on March 26 to address a conservative forum organized by Rep. Steve King is sparking another round of chatter that DeMint might launch a dark horse bid for the White House in 2012. The Republican gadfly has been adamant in denying such intentions for more than a year – just Wednesday, he gave CNN's Wolf Blitzer a flat "No" when asked if he plans to seek his party's presidential nomination. But the ground may be shifting in DeMint-world, and several of his closest advisers and political confidantes are now telling CNN that he is at least open to a presidential bid if a suitably conservative candidate fails to emerge from the early and wide-open GOP field. "I think that you can read into it that he sees he has a role in the process and he hasn't completely shut the door," said one DeMint adviser asked about the Iowa foray. DeMint currently sees his role in the 2012 process, the adviser said, as "setting the bar high" for the presidential contenders when it comes to advocating for a small government agenda. "He hasn't completely shut the door on running, and if there is a massive void in the group of candidates, who knows what could happen?," said the adviser, who was quick to caution that there is only a five percent chance the senator will run. Aside from Indiana Rep. Mike Pence, who is currently deciding between a presidential run and a gubernatorial bid in his home state, DeMint's advisers are having a difficult time envisioning a candidate that he could get behind. DeMint may not endorse any presidential candidate this cycle, one adviser told CNN - a far cry from his 2008 strategy, when he endorsed former Massachusetts Gov. Mitt Romney early on in the process. Some in DeMint's orbit been asking him to at least consider running for president as early as last year. Since November's elections, DeMint has been working on finishing a new book set for publication this summer, "The Great American Awakening: Two Years that Changed America, Washington, and Me." Peter Brown, a prominent South Carolina donor and a member of DeMint's kitchen cabinet, predicted that DeMint could warm to the idea of a White House bid as the rest of the field takes shape. Brown said potential candidates like Romney, Sarah Palin, Mike Huckabee, Newt Gingrich are failing to generate any kind of broad excitement among conservatives. "Over the next three months, I think Jim is going to be extremely frustrated with both the Republican Party and President Obama and the Democratic Party," Brown told CNN. "The only reason Jim might consider running for president is because he will realize the momentum of the November elections has died." If he did run, DeMint would enter the race with certain advantages. He developed a national following among conservative activists during the 2010 midterm elections as he endorsed and raised money for a number of Tea Party-aligned Senate candidates – a network he would be able to tap for money and support. Ovide LaMontagne, who sought the GOP nomination for Senate in New Hampshire with DeMint's support last year and is now looking for a candidate to back in 2012, welcomed the news the DeMint was heading to Iowa. "It's exciting to think that he might actually be serious about exploring a run," LaMontagne told CNN. "This is going to be a wide-open primary. There is definitely room for someone with the record and commitment to the conservative principles as Jim DeMint. I hope he will contact us and come to New Hampshire." "He would certainly be the odds on favorite here," said Terry Sullivan, a South Carolina GOP consultant and longtime DeMint adviser. "He wouldn't be slam dunk, but he is definitely the favorite." Sullivan stressed that while DeMint "doesn't want to run" for president, he is nevertheless considering a bid. "The party is kind of lost, people are pulling it in different directions," Sullivan told CNN. "There is no one that can break through and clearly identify a direction for the party. It's certainly something he is not going to close the door on until he finds a candidate." Another of DeMint's confidantes said that the Senator's commitment to promoting conservative ideals – "which runs to his core" - could compel him to enter the race. DeMint does not want to run, this adviser said, but added: "You've got to have a messenger." "I want him to be considerate of what's at stake in the next election," the confidante told CNN. "I want him to be open to the calling that he should run for president. But I would never urge somebody to run for president." UPDATE: DeMint adviser Matt Hoskins re-iterated that DeMint's trip does not signal any presidential ambitions. "Senator DeMint has absolutely no plans to run for president. He's going to Iowa to talk about the conservative agenda - nothing more, nothing less," Hoskins said in an email. Does anybody care what this sorry nutcase is open or closed to? We have not had a secessionist president since Jefferson Davis, so think it is time for DeMint Julep to make a run. He should run. The comedy factor alone will be priceless. Get the thought out your fascist skull Demented. Hey, isn't this the guy that was for the "tea party" before he was against the "tea party?" And a note to my dear neighbors in SC – what are you thinking with this guy? Does he really do it for you or is he just imbedded with a name that's easy to remember? Seriously, I'd love to hear why you think he is most representative of you in the Senate. Of course we have Chambliss (who attacked a war hero) and Isakson (who finds it more important to protect insurance company profits than the people of GA), so I have no room to talk. go back to the hole you came from fruitcake. "Gadfly" is about right – a pest that spends half its time distracting people from doing anything productive, and the other half sitting on a pile of excrement. The best thing that DeMint can do to make government smaller and more effectives is to leave office. When you know your views do not go along with the majority of Americans you stay in your space. If he feels so strong about it his views than run instead of hiding in the Senate. He can promote conservative ideals all he wants to, but those ideals won't unite the country, they only serve to divide and Balkanize our great country. He has openly pitted groups against each other to raise his own inconsequential profile. Here's a question for ya: can you name one significant piece of legislation he has introduced or co-sponsored that has been signed into law? No Mr. DeMint, we don't want you either. Wow, the GOP really has no one ! DeMented is just another Republican air head with out a clue what real people need and want from the government, All he does is re-play the party line like a broken record and like a broken record he should be tossed in the trash. The Republican and the Tea Party If you want too win In 2012 you will have too put someone that at lease have a chance to win. These people don't have a chance too win ,they are Jim DeMint,Saran Palin,Sharron Angle, Michele Backmann. This is great news. Jim DeMint is the finest congressman in the nation and is exactly what we need for president. A Jim DeMint/Mike Pence ticket would be perfect and would bring this country back from the depth and despair of the two idiots that currently hold those positions. All the loons have come out ! I bet the moderate republican's are hating that they ever gave the teaparty simpletons a microphone . Now they can't even get them to shut up ! Jim Demented , oh sorry Demint would get roasted by President Obama ! Demint wouldn't be able to rig a general election like he did his senate bid ! The teaparty repub's in congress have sucked up all the air from the moderate republican's, just look at how they had dueling SOTU responses ! I predict these fool's spend more time beating up each other trying to see who's more stupid while the Democrat's try to solve our problem's with a calm sensible approach ! Just watch the republicans will self destruct now that they are actually responsible for making policy decisions, the public will remember why they voted them out in the first place ! Someone please tell this guy (hopefully one of his advisors) that you need charisma if you wnt to win votes for President. DeMint has done nothing in public life except to advance himself. He made it clear for years that he had no interest in the challenges facing the people of South Carolina... or finding solutions to problems facing our country. Everyone here knows that if you need help in Washington, Lindsey Graham is the go-to guy. The Senate is boring where even the Republicans don't like him. Of course he will run for President. Besides, you get a cool house with the deal. LOL. So what Republican ISN'T running? I hope he does run and picks Palin or Bachmann as his running mate. Should be an electoral landslide for Obama. Why don't people like DeMint get the fact that maybe at most 20% of the country sides with their extreme right wing nonsense? It's bad enough this racist, homophobic moron is in the Senate. The last thing we need is him being the face of America. I mean he said he wouldn't vote to raise the debt ceiling EVEN if they came up with a balanced budget. That's great Jim. Keep up the great work...tool. I think Romney generates a lot of excitement among conservatives. . .he's my vote for 2012! Plough he'll noo, the heart of the lunatic right, what is this world coming to, they won't raise taxes, even if the the country is in a firery flame, they won't mess with the are force medicare and social security, which makes up 25 percent of the budget, they ignore 90 percent of America that is not rich and don't have the ability to voice their opinions and their ideology because they can't compete with the rich and famous. They want to cut every thing that the poor and helpless need to survive as they flourish the rich with tax breaks and at the same time screaming and hollering about the coming anialation of our country because of the budget. They want to distroy healthcare because the government mandate that healthcare insurance companies have to give back 80 percent of what they bring in back to the people, and with every one having to pay for insurance in 2014, they will ne giving back bundreds of thousand of dollars and pushing the premiums down while giving the Feds nearly a trillion dollars over 10 years. Mr Demint stop! To quote my post on Angle considering a run.....Are all Tea Partiers delusional? President Neanderthal? I think not.